Korangy, Alireza & Corey Miller (eds.). 2018. 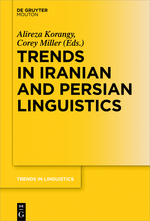 Trends in Iranian and Persian linguistics (Trends in Linguistics. Studies and Monographs 313). Berlin: De Gruyter. This set of essays highlights the state of the art in the linguistics of Iranian languages. The contributions span the full range of linguistic inquiry, including pragmatics, syntax, semantics, phonology/phonetics, lexicography, historical linguistics and poetics and covering a wide set of Iranian languages including Persian, Balochi, Kurdish and Ossetian. This book will engage both the active scholar in the field as well as linguists from other fields seeking to assess the latest developments in Iranian linguistics. See the table of contents here.